Inscription: AT THE BOTTOM OF EVERY WHISKEY GLASS. 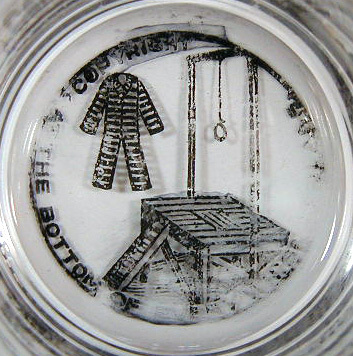 / COPYRIGHT (text forms a circle around an etched scene of a prisoner's striped overalls at upper left, and a wooden gallows with hanging noose at lower right). Very rare temperance glass - and a color label-on-the bottom! 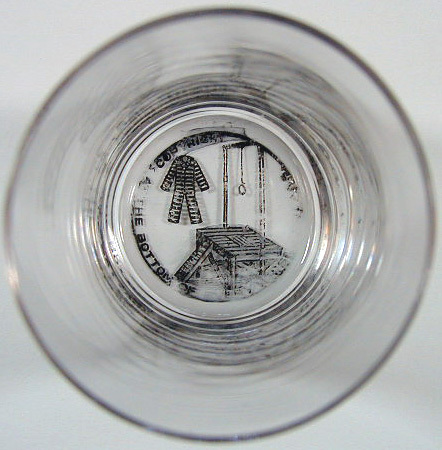 Dimensions: 2-1/4" x 1-7/8" x 1-9/16"
Condition: There is a small double chip in the rim srface and superficial handling marks to the body of the glass. The label is scuffed in places, but this is a rare one..